Leimert Park lit up the night of February 23, 2017, at the exhibition opening of BlackMusic, BlackWork. Presented in conjunction with the Los Angeles Black Worker Center, UCLA Labor Center, the exhibit shares the dynamic history of organizing in the arts spans the founding of the Black musicians union Local 767 in the 1920s to the contemporary struggles of working musicians who understand the transformative power of art and culture. Special guests speakers included AFM Local 47 President John Acosta, Executive Secretary-Treasurer, LA County Federation of Labor Rusty Hicks, Los Angeles Black Worker Center Co-founder Lola Smallwood Cuevas and member Andrene Scott, and Dr. Robin D.G. Kelley, Professor and Gary B. Nash Endowed Chair in U.S. History at UCLA. Black Worker Center member Patsy Howard served as MC. Representatives from Marqueece Harris-Dawson (District 8) and Herb Wesson (District 10) presented Certificates of Honor to the creators of the exhibit, and to the families of 767 members Buddy Collette, Gerald Wilson, Horace Tapscott, and Red Callender who were in the audience. Big Jay McNeely, an original member of 767 and a Life Member of Local 47, was present to accept his honor and share a few memories of his early career. Now 89, he’s still going strong, having just released a new record and continuing to perform concerts around the world. Live music was highlighted throughout the program. Vocalist Hasani Davis sang an a cappella version of “Lift Every Voice and Sing,” also know as the “Black American National Anthem.” The Nedra Wheeler Trio (Wheeler – bass, Nick Smith – piano, Donald Dean – drums) performed selections written by 767 legends Charles Mingus, Buddy Collette, Gerald Wilson, Red Callender, Horace Tapscott, John Coltrane, and Marl Young. 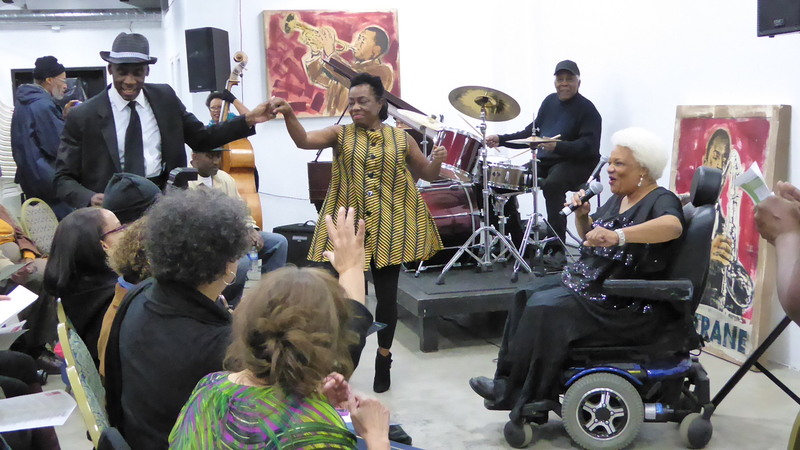 Acclaimed vocalist Barbara Morrison joined the band in a lively rendition of “Things Ain’t What They Used to Be” by Mercer Ellington and Ted Persons. The exhibit will be open through June 30, 2017, at the new California Jazz and Blues Museum just opened by Barbara Morrison. For museum hours call (323) 350-1962. This entry was posted in All News, Features and tagged BlackMusic BlackWork, Local 767, Musicians Protective Association on February 27, 2017 by admin.